By now, the wine-drinking public is familiar with sustainability descriptors like organic, biodynamic, and even natural. They’ve been to LEED-certified wineries, and they may even have heard about a more holistic certification, called B Corps, which takes into account the way a business treats its employees, its environment, and its community. But a new wave of winemakers is working with ultra-sustainable practices—some of which are so groundbreaking they don’t even have a certification yet. SevenFifty Daily spoke with winemakers who are setting the bar with green building and agroecological farming practices to learn why they’re worth pursuing—and how they can help create a more sustainable future. A few years ago, when Cowhorn winemaker Bill Steele was planning a new tasting room at his Jacksonville, Oregon, winery, he had a game-changing conversation with Stephen Aiguier, the founder and president of Green Hammer. Steele and his wife, Barbara, knew they wanted a green building. Aiguier listened as Steele talked about his aversion to chemicals in the field and in the cellar. “We wanted a building that was consistent with our biodynamic farming philosophy,” says Steele, whose winery is located in the Applegate Valley AVA. “And Stephen said, ‘It sounds like you’re describing the Living Building Challenge.’” Once Aiguier started explaining it, the Steeles were all in. The most rigorous standard for green buildings in the world, the Living Building Challenge (LBC) was formulated by the Seattle-based International Living Future Institute (ILFI) in 2006. It’s designed around seven performance areas, referred to as petals. Unlike other certifiers of green buildings, the ILFI won’t certify a building until a full year after it’s completed. That’s because some of the building’s petals—namely, energy and water—require 12 months of continuous occupancy before they can be shown to work in accordance with the challenge. The Energy Petal requires that the building produce 10 percent more energy than it consumes; the Water Petal requires (among other things) that 100 percent of the project’s water needs be supplied by captured precipitation or other natural closed-loop water systems. There’s a reason it’s called a challenge. Barb and Bill Steele of Cowhorn. Photo by Clair Thorington. But the Green Hammer team persisted. Fortunately, the ILFI has a product database of nontoxic building materials (made without Red List chemicals) called Declare. High-profile companies—Etsy and Google, for example—have publicly signed on to using Declare products in their buildings. As a result, materials vendors are starting to reformulate their products and be more transparent about what’s in them. In May 2018, Cowhorn’s tasting room became the first winery tasting room in the world to be named a Certified Living Building. And it’s not that other wineries haven’t tried. 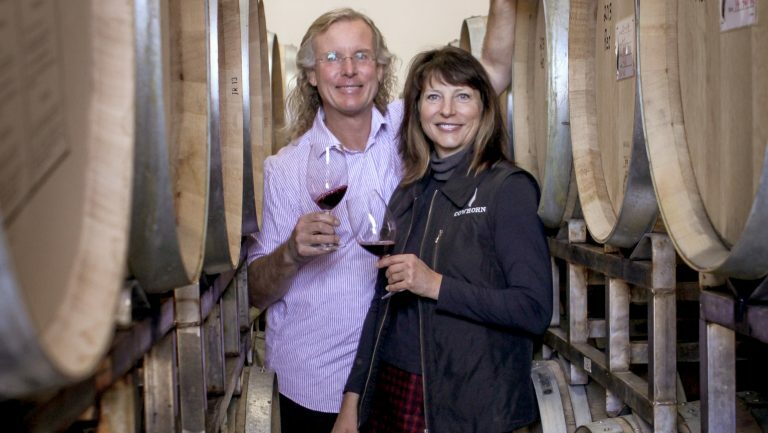 Sokol Blosser, which had already achieved a U.S. Green Building Council LEED certification for its barrel cellar in 2002, aimed for LBC with its new tasting room but was unable to achieve certification.